Have a lot of data in an Excel worksheet, and consider some of the rows to be duplicates? Here is how to determine whether a row is a duplicate. When editing Excel workbooks, one of the most common actions to take is to clear or delete cells…although the difference between the two actions is clear as mud. When working with data retrieved from another source—such as another user or from an external program—you may have a need to remove certain rows from the data. It is not unusual, for instance, to have the need to remove every third row or every fifth row. The following general steps allow you to delete every X rows without using a macro. There are times when it is beneficial, or even mandatory, to spell numbers out. 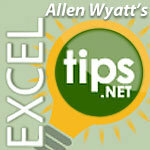 When you import ZIP Codes from a text file into an Excel workbook, it is not uncommon for Excel to translate the values as numbers rather than as ZIP Codes. When updating the data on which the PivotTable is based, and then refresh the PivotTable, all your formatting work may go away.